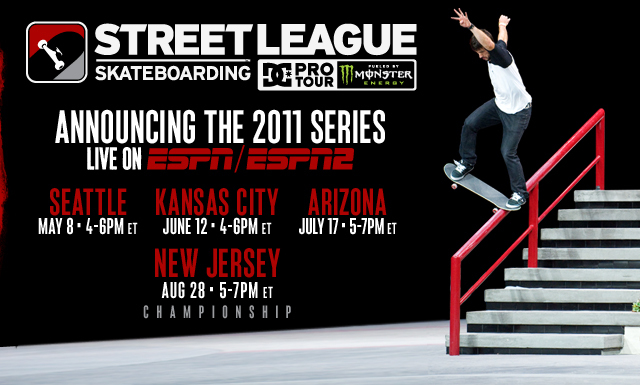 Los Angeles, Calif – Street League Skateboarding™, the premier professional street skateboarding series worldwide, has announced the 2011 League schedule with live programming on ESPN, ESPN2, and an international webcast of each stop of the nationwide tour. Street League will kick off its second season in Seattle, WA this May and end with the Championship event in Newark, NJ. Founded by 20-year professional skateboarder and entrepreneur, Rob Dyrdek, Street League features 24 of the world’s top street skateboarders competing exclusively for a groundbreaking $1.6 million prize purse. Utilizing the ISX™ instant-scoring format Street League keeps viewers at the edge of their seats from the first trick until the very last. In 2010, fans witnessed historical endings at each event with Nyjah Huston, Sean Malto, and Shane O’Neill all having to land their final trick to clinch the first place honors and $150,000 in prize money. When the dust settled, sixteen year-old Nyjah Huston was crowned the overall Street League champion. The stakes are being raised for the 2011 series with the addition of a winner-takes-all Championship on August 28th. Winners of the first three stops will have a golden ticket directly to the Championship event with the seven other championship contenders being determined by overall ranking. These ten Street League pros will qualify to compete for the $200,000 championship prize – the largest first place prize purse in skateboarding history as well as the Street League championship watch and ring. Adding to the excitement, the series will introduce section elimination during the finals. Two riders with the lowest scores will be eliminated in each section, reducing the field from ten finalists to six for the final big section at each event. In its inaugural year, Street League delivered the highest attendance in street skateboarding history and received more than 2 million viewers domestically with its ESPN broadcasts, as well as international distribution in more than 198 countries. Tickets go on sale April 1st and will be available for both Saturday’s qualifier and Sunday’s finals. For more information please visit www.streetleague.com.